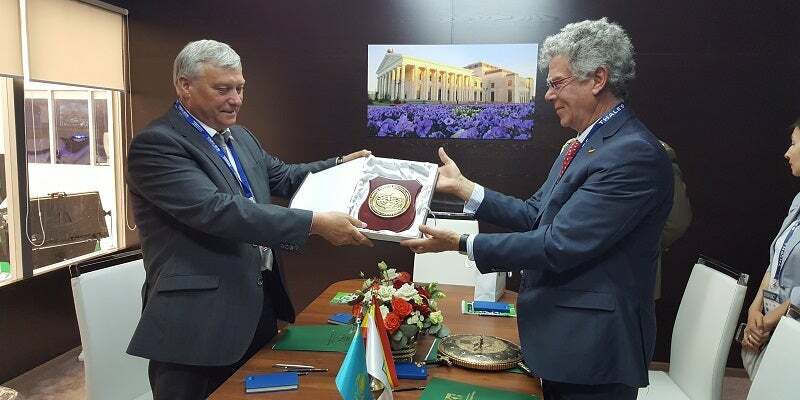 SAES and the Kazakhstani GIDROPRIBOR have signed a memorandum of understanding (MoU) to supply underwater systems to the Armed Forces of Kazakhstan. The agreement includes installation, commissioning, testing, maintenance and end-customer support of several systems: diver detection sonar (DDS-03) for protection of ports, naval mines both exercise and combat versions (MINEA series) and underwater measurements systems (MIRS). By the agreement, signed in Astana (Kazakhstan), while the fourth edition of KADEX Defence Exhibition was being celebrated, the collaboration between these companies has been reinforced. They already signed in 2014 a memorandum of cooperation for joint production and marketing of Diver Detection Sonars (DDS-03). This new pact establishes the basis for the production and marketing of underwater surveillance and protection systems based on multi-influence measurements (acoustic, electric, magnetic, seismic and pressure). SAES (Sociedad Anónima de Electrónica Submarina) is specialised in underwater acoustic and electronics and it is positioned at the forefront of the market in the area of multi-influence underwater measurement and signature intelligence. The familiy of multi-influence naval mines (MINEA) is able to detect any signature radiated by a ship and the portable measurements station, multi-influence range system (MIRS), ready for quick and easy installation where required to take signature measurements of ships, are two powerful examples of this line of business of the company. SAES possess the experience of more than 27 years working in numerous naval projects in all types of platform (minehunters, submarines, aircraft, maritime patrol, ASW helicopters, mission control centres, simulation facilities). This is the second agreement reached between SAES and GIDROPRIBOR Kazakhstan. The first, signed in 2014, also during the celebration of KADEX, allowed the introduction, in the area of influence of Caspian Sea, the high-frequency active sonar, DDS-03, specially designed for the detection of divers and underwater vehicles, manned and unmanned (SDV, ROV or UUV) for the protection of ports, ships and critical infrastructures. By this agreement, SAES and GIDROPRIBOR have sealed an alliance in order to meet present and future needs of the Armed Forces of Kazakhstan in underwater defence systems.